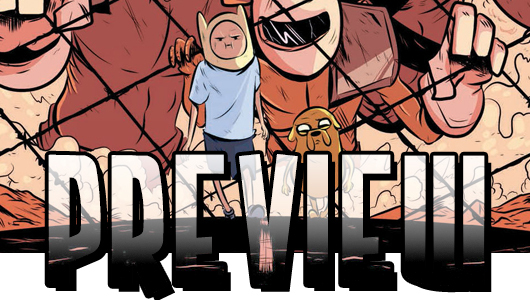 It’s time to take a trip back to the land of Ooo with a preview of KaBOOM! Studios’ Adventure Time: The Flip Side #3 (of 6). Written by Paul Tobin and Colleen Coover (Bandette) with art by Wook Jin Clark, this is another in the line of great Adventure Time comics that KaBOOM! has produced. In this issue, Finn and Jake need to get the help of the Monkey Wizard so they can kidnap Painting Princess. With Marceline helping them out, will they finally reach their goal? As you can see from the pages below, Clark’s style doesn’t look exactly like what you normally see on the show, but it has the same energy, and that’s what’s important. Tobin and Coover have been doing great work on Bandette, and it’s great to see KaBOOM! lining up great talent to work on their Adventure Time books. Check out our exclusive look here below of the first batch of pages from Adventure Time: The Flip Side #3 as well as the four covers from Clark, Nicole Miles, Heather Danforth, and Sloane Leong, and be sure to pick up the issue on March 5, 2014 or pre-order it now.